EA has recently surprised some fight fans by releasing their Mixed Martial Art brawler. The title features some of the top ranked fighters from around the world like Bas Rutten, Randy Couture and the once hailed as ‘invincible’ Fedor Emelianenko. Mixed Martial Arts is a sport that has really gained popularity in the last few years and it is a very technical sport that requires dedication from more than one discipline. Striking, grappling, throws, and submissions are skills that are all needed in order to be a complete fighter and EA’s MMA allows you to dip into all these combat methods. 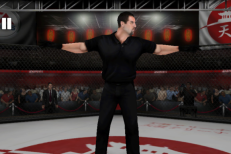 Customization, options, and graphics are some of the other strongpoints EA’s MMA has to offer. Some of these options include the ability to choose the locations of exhibition matches and the layout of the octagon (four corners or circular for instance). The graphics are also very crisp despite the movement animation being a bit clunky. Fighters are very recognizable by facial and proper size and weight animations. Muscle tones and even veins are visible on Randy Couture’s arms as are tattoos on other fighters. There are even fighter bios with a bit of info about each fighter done by a commentator. Certain strikes will also result in cuts that are shown on the faces of the fighters in the matches. The controls are tilt based for movement and touch base for input. So to clinch standing you have to swipe your fingers inwards in range or go for a takedown you have to swipe them downward. And you can keep improving positions in each clinch. But if you just want to strike, you tap with the finger when the opponent is in range either high or low on either side — representing high or low attacks from both sides of the body. You can also do some strikes with the swipe of a finger like an inward-swipe with some fighters will result in a haymaker or upward swipe in an uppercut. Blocking is done with the press of both fingers simultaneously. In order to keep the submission on the opponent or prevent him from escaping and to escape yourself — There are input commands you need to enter by following a prompt showing a marker where to put the finger inputs. As for movement, it is done by tilting — tilt inwards or outward to do a side step or left and right to move in those directions. The movement in this game generally is very unresponsive and is one of the biggest drawbacks of the title. Sometimes a wrong tilt is recognized and the fighter will take an outward instead of inward step for example. If EA can add other control options such as a touch dpad in future updates, it would really improve the game as the controls are it’s biggest downfall — especially movement. There are three modes to choose from and they are exhibition, career, and challenges. Challenges present various fights in MMA history re-envisioned where you have to win a certain way, or simply things to overcome like defeat a certain opponent with a particular opponent chosen for you in a particular round. Exhibitions are fights you setup with any fighter of your choosing against one you choose to go up against. Career is really the main draw of the game however. You create a fighter of your choosing and send him to fight against other fighters until he can win a championship. Along the way, you will also train the fighter to improve certain attributes in-between bouts. When creating a fighter you can select the nickname, age, and country of origin. Designing the way he looks, gear he wears, attitude, and weight class are some other options to customize as well as choosing the fighting style he excels at. There is also a dice input randomly generating a fighter for you. Creating my fighter was some of the most fun I had in the game, as there are so many options to choose from and it is satisfying seeing how the fighter will do in combat. There are a wide range of options to choose from and the lasting appeal should be good for any MMA or fight fan. I suggest to fix the controls to either make them a lot more fluid and responsive or to at least add a dpad control method when walking (the grappling or ground fighting animation is very fluid on the other hand). The fighters also need to be able to run in toward their opponents or change speeds for takedowns rather than walk in such a robotic or rigid fashion. I would also suggest some online multiplayer fight-mode to be added. More options in terms of submission techniques could also be added so you wouldn’t have to wait to be on the bottom to do a guillotine for example but can from a standing clinch — same thing could be applied to takedowns or throws with more variety needed. I would also suggest iPad native-resolution support. The controls are the biggest issue that keeps the title from really becoming a must have for anyone outside the MMA or huge brawler fans however the presentation is really well done. Voice commentary, great graphics, lots of options to choose from and fights to relive are all very well implemented. The way the fighters escape and switch positions on the ground are very well done and made me feel sometimes as if I was fighting in that octagon — and forget this game is running on an iPhone. With some improvements to controls and technique variety I could really see this title become an iDevice-fighter benchmark.